Many realize using videoconferencing to take out-of-town depositions reduces travel expense, but the real cost of travel is better measured by the loss of productivity and efficiency. Billable hours are the key to success and profitability of any law firm. Videoconferencing significantly decreases time spent away from your office, home, and family. Squeeze more hours into your day! Choose from videoconference locations anywhere nationwide – just let us know where and when, and we’ll take care of all the arrangements. Save yourself both time and travel expenses. 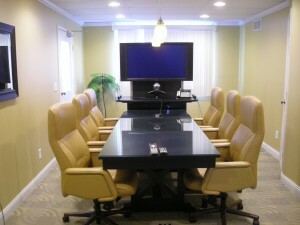 Single or multi-site videoconferencing available. As always, you will receive a detailed invoice. Many people who work in the court system recognize the importance of court reporters and their services. Court reporters are responsible for transcribing the events in each court case they sit in on. Often, this means transcribing over 180 literary words, 225 testimony words, and 200 jury charge words per minute while maintaining 95% accuracy in their transcript. 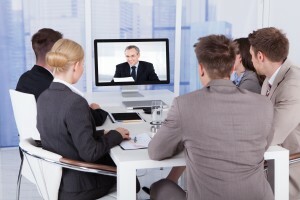 A newer development in the court reporting field is legal videoconferencing. Legal videoconferencing allows the team working on a case to more easily and effectively communicate. There are innumerable benefits to using this technology in a court case.The biggest benefit of legal videoconferencing is that it opens up opportunities for collaboration. Whether it’s between lawyers, witnesses or experts, being able to communicate “face-to-face” can be a huge asset. Another perk is being able to train or prepare adequately without needing to worry about distance. Travel can be a deal breaker for some people because of a lack of either time or money — or both. Videoconferencing allows remote participation, which benefits both parties. This option is even better for large firms with multiple offices. Rather than spending time moving between offices, lawyers can spend their time actually working. Legal videoconferencing, though relatively new, can also be an asset during a case. Being able to bring in other people who couldn’t otherwise make it to court allows for more evidence or witnesses, or even expertise, to be involved in the case. This can significantly increase the fairness in each trial or case. People who would not have been able to give their defense or side of the story can now do that, no matter where they are in the world. Legal videoconferencing will likely only gain popularity in the coming years, due to the numerous benefits it provides — and it will improve not only law firms, but the state of the justice system. 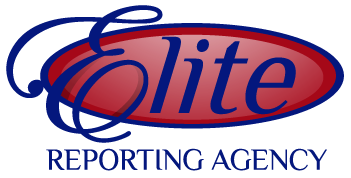 To schedule a videoconference for your next out-of-town deposition, give us a call at 513.233.3000, email depo@elitereportingagency.com, or click on the scheduling button above.